UV light invisible ink pen can mark playing cards. Some poker players and magician had tried to make invisible ink pen, but the results are not satisfactory. How to get a professional luminous ink pen? 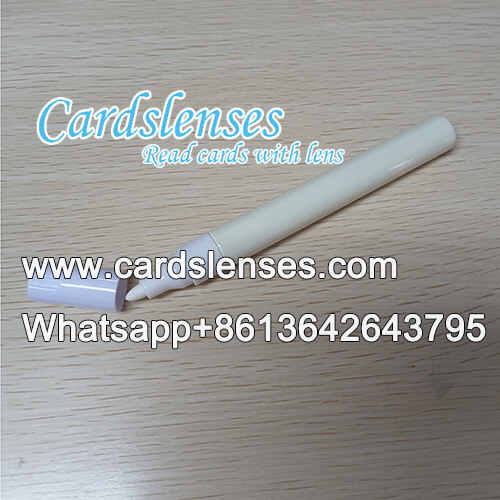 GS marked cards juice deck invisible ink pen is a best choice for you. Having ten years experience in marking playing cards with luminous ink, GS Marked Cards has advanced and proven technique in making UV light invisible ink for ultimate marked deck. If you want a technical and advanced marked poker cards UV pen, GS Marked Cards Company always will not let you down.